This undated photo shows the death chamber at the Georgia Diagnostic Prison in Jackson, Ga. Public support for the death penalty has declined sharply in the past two decades, according to polls. The Death Penalty Information Center released its annual report on Friday. In the past two years, executions have ticked up slightly, but the report says that a broader look at the data reveals the "continuing erosion of the death penalty across the country." "This is a sustained generational low," said Robert Dunham, executive director of the center, which has been critical of the way capital punishment is carried out. "The last four years combined will have exactly half as many death sentences as the preceding four years." 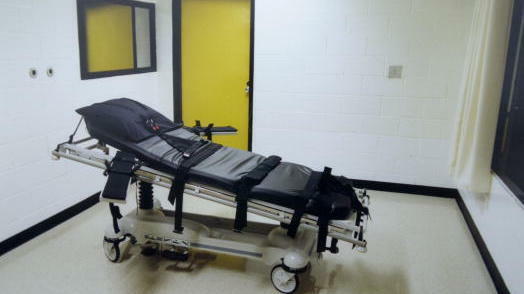 While the punishment is legal in 30 states, the majority of them don't carry out executions. According to Friday's report, only eight states — Texas, Tennessee, Alabama, Florida, Georgia, Nebraska, Ohio and South Dakota — put prisoners to death this year. In October, Washington became the latest state to ban the death penalty after its Supreme Court ruled it had been imposed both arbitrarily and with racial bias. In an interview with NPR, Elisabeth Semel, director of the Death Penalty Clinic at Berkeley Law school said that despite the fact that executions are up slightly from a 25-year low in 2016, "there's no question that this is a dramatic downward trend." Semel said Americans' support of the death penalty has chilled since it reached a fervor during the "tough on crime" mentality of the 1980s and 90s. "I think there's been a reassessment, just as there's been a reassessment about mass incarceration," Semel said. "It's become less of a battle cry for politicians than it used to be." Experts looking to explain the trend also point to exonerations of death row inmates, botched executions and increasing objections by conservatives to the death penalty. In August, Pope Francis approved a revision to Catholic teachings, calling capital punishment "inadmissible because it is an attack on the inviolability and dignity of the person." Friday's report says that there has been about one exoneration of a prisoner on death row for every nine executions. In 2018, three prisoners awaiting execution had their sentences reduced to life in prison; two prisoners, Vicente Benavides and Clemente Aguirre-Jarquin, were exonerated.